The Water Mill Museum is to preserve its historic water-powered grist mill, the other buildings at its site, its museum collection and inform the public about the history of the mill, the hamlet of Water Mill and the hamlet's cultural and natural heritage. The mission of the Water Mill Museum is to preserve its historic water-powered grist mill, the other buildings at its site, its museum collection and inform the public about the history of the mill, the hamlet of Water Mill and the hamlet's cultural and natural heritage. The museum's collection will contain items that best depict the many past uses of the water mill building, the agricultural base of the hamlet's first 300 years and the commercial, cultural and social development of the hamlet of Water Mill from 1644 to the present. In colonial America, mills powered by water or wind were the most advanced form of power. They were used to grind grain, saw wood, full cloth, tan hides, weave fabric and make paper. Water mills or windmills appeared in every colonial settlement. The story of this water mill begins in 1640 when a group of English colonists came to Southampton. The mill was built in 1644 and has been used for many purposes throughout its history. In 1968 a project to restore the mill as a museum began and this historic grist mill was grinding grain once again for the 1976 bicentennial. 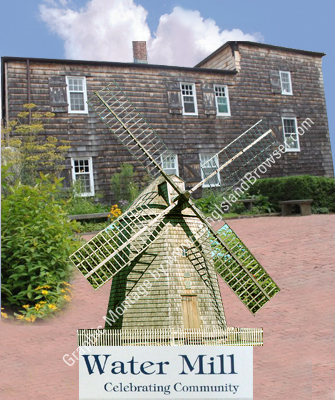 Today the Mill and Museum is owned and operated by the Water Mill Museum Inc., a non-profit organization.